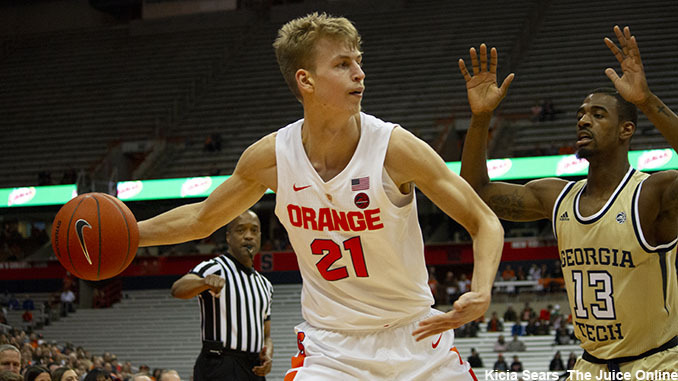 Jan 19, 2019; Syracuse, NY, USA; Syracuse Orange forward Marek Dolezaj (21) looks to drive during the Orange's 74-63 win over Pitt at the Carrier Dome. Mandatory Photo Credit: Kicia Sears, The Juice Online. With roughly five weeks and 11 games to go, Syracuse basketball is in crunch time to pad its resume for the NCAA Tournament. Currently, the Orange is widely projected to be on the inside looking out, which has not always been the case in the last few years. The Orange’s best two wins are a non-conference true road win over Ohio State in the ACC/Big 10 Challenge, and then a dramatic overtime in over Duke in Cameron Indoor Stadium. On the flip side, Syracuse’s two worst losses right now are to Georgia Tech and Old Dominion, both at home. Though it was certainly ugly, the Orange’s blowout loss on the road against Virginia Tech doesn’t necessary hurt its rating too much, since the Hokies are considered a Quadrant 1 game. The possibilities are so tantalizing that Washington and Syracuse would meet in the first round. Mike Hopkins is clearly doing a great job with the Huskies. He was the 2018 Pac-12 Coach of the Year after finishing with a 21–13 record, and his recruiting has really picked up recently. Hopkins and his staff recently landed five-star prospects Isaiah Stewart and Kentucky transfer Quade Green. The Orange still has plenty of chance to improve its resume. Still left on the docket are games against No. 25 Florida State, No. 23 NC State, No. 2 Duke, No. 9 North Carolina and No. 3 Virginia.